Dan Schmiechen is on vacation for the next two weeks. 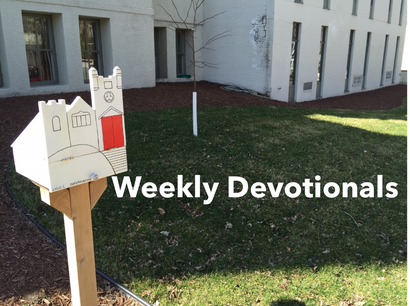 This week's devotional is by LHUCC Communications Coordinator Dennis Sanders. When I was in my 20s, I spent eight months working at a non-profit on Central American issues in Washington, DC. I went one time to a meeting on Capitol Hill in one of the office rooms. As the meeting went on, a slender woman smartly dressed with dark hair came and sat down next to me. The woman asked me some questions about the event as she tried to get a good view. I was a bit annoyed because I thought this woman arrived rather late. I gave her a rather curt reply to her questions. She stayed a little longer and then got up from her seat and left. When the meeting ended, a young woman who worked at another non-profit came up to me rather excited. "Did you know who you were sitting next to?" I nodded that I didn't know. "That was Bianca Jagger!" I sat next to the former wife of Rolling Stones lead singer Mick Jagger. The Nicaraguan-born former actress was also involved in human rights issues taking place in her native Nicaragua and the rest of Central America, so it would make sense that she would show up to this event. But I didn't know any of this. I just thought she was a pushy well-to-do woman when she was so much more. Jesus has the opportunity to speak to a hometown audience in Nazareth. You might think that Jesus would be welcomed in his hometown and that there would be pride at the things they heard about him. But instead of praise and pride, Jesus got rejection. They townsfolk thought they knew Jesus. They knew he was a carpenter, just like his Dad. They knew he was Mary's boy. They knew his brothers and sisters. They thought they knew him. And yet they didn't. They didn't see that Jesus was much more than the hometown kid from Nazareth. They didn't realize that he might be something more. God and the things are of God are not always so visible. Sometimes God blends into the scenery, hard to find. It means that we must keep our eyes- and our hearts- open to what God has to say. We learn that because the people didn't believe, Jesus couldn't perform any miracles there. The people missed out, not because God was punishing them, but because they couldn't see where God was active. I pray that I will always be on the lookout for God, waiting to see where and how God will show up. May that be your prayer as well. And if I ever see Bianca Jagger again, I promise to be a lot nicer. It's in fact very complex in this busy life to listen news on TV, so I only use the web for that reason, and take the latest news. Hello it's me, I am also visiting this web page daily, this web site is in fact nice and the viewers are actually sharing good thoughts. I am regular visitor, how are you everybody? This piece of writing posted at this site is actually fastidious.